The Pylon Camera Software Suite includes Pylon Viewer (for configuring cameras, viewing and saving images, and recording live video), USB Configurator (for optimizing and troubleshooting USB cameras), IP Configurator (for optimizing and troubleshooting GigE cameras), and a complete SDK for software developers. This unified suite supports nearly all Basler cameras including the ace, aviator, beat, dart, pilot, pulse, scout, runner, racer and, coming soon, boost. Pylon can be used to configure Basler Camera Link cameras, but does not support image acquisition over this interface. Basler cameras are built on today’s interface standards: GenICam, GigE Vision, USB3 Vision, IEEE 1394 and/or CameraLink. The cameras are therefore compatible with most third-party hardware and software components running on all popular platforms. Pylon also includes adapters for interfacing with software that supports GenICam GenTL, DirectShow and TWAIN. Using third-party software for camera communication is often expedient, especially when custom image processing is required. However, there are a couple reasons you may consider using Pylon. First, Pylon Viewer is a quick way to configure and test a camera. Second, Pylon offers complete access to all camera settings. And third, most other software has a license fee, while Pylon is free. 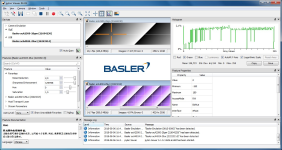 Many volume customers therefore choose to use the Basler Pylon API to communicate with Basler cameras. Links for downloading recent versions are on the Resources tab below. Linux, OSX, and older versions can be downloaded from www.baslerweb.com.